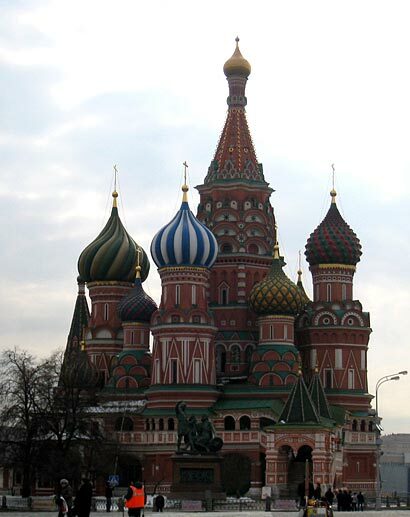 10 years have passed since I visited Moscow last time. Maybe due to the good weather, the snow-covered landscape I saw from the windows of the airplane looked bright and cheerful. The airport also looked clean and modern compared to the dreary Sheremetyevo Airport I remembered from my visit in the 1980s and 1990s. I noticed after landing that the airport was not Sheremetyevo but the Domodedovo International Airport. After a short walk in the terminal building, I found that although Domodedovo Airport was modern, it was not as luxurious and well facilitated as many new Asian and Middle-Eastern airports. It was rather compact in size and the carriage porch was still under construction, or was deliberately so constructed that vehicles of the airport users could not have direct access to the terminal, but must stop 20 or more meters away from the entrance of the terminal building and everybody had to walk through the area with bumpy naked concrete ground and barricades. I had to laugh, because I had suspected I could find a legacy from the Soviet time. Though the road traffic in and around Moscow was not as intensive as the time before the outbreak of the economic crisis at the end of last year, according to the explanation of a friend of mine, I encountered traffic jams several times before I arrived at my hotel. Cars which were rushing on city roads were mostly big and of new types though they were awfully muddy because of melting snow. The temperature in Moscow was not as low as I had expected. While I was in Moscow, the highest daytime temperature was 7 degrees Celsius and about the same as in Tokyo. As a tourist I could feel the effect of global warming on Moscow. What surprised me was the penetration of the luxury consumer market into Russia. 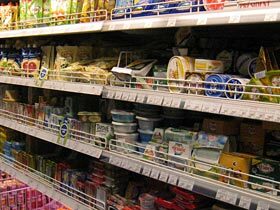 Supermarkets were full of commodities and their line-up was abundant and varied, which was inconceivable only a couple of decades ago. The biggest surprise for me was Gum. 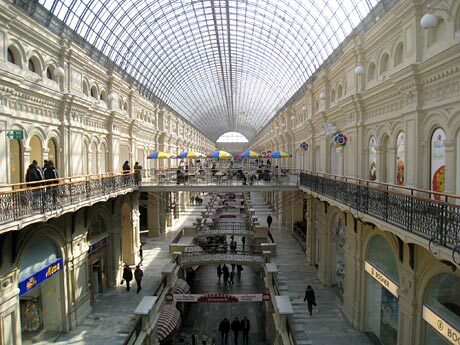 Though I believed that Gum was a sort of bazaar where people could buy a limited range of Russian domestic products, not of good quality but relatively cheap, Gum turned to be an elegant gallery with Western brand shops. This time I wanted to buy caviar in Moscow, as I believed that caviar was a representative souvenir of Russia without knowing that the situation had drastically changed in the last decade. 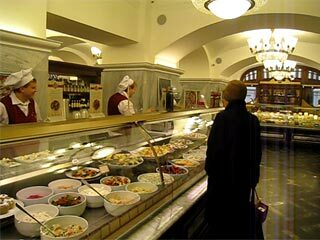 Though caviar was not extremely cheap 10 years ago in Moscow, I could buy some tins as souvenirs. I still remember that I could buy a middle size package of Beluga caviar at 40 or 50 $ in Moscow, while the same product cost only 10$ in Baku, Azerbaijan. But, this time I discovered that the export of caviar was not permitted. In the tax-free shops at the airport they solely sold "red" caviar - salmon roe. The caviar I found in a luxury food shop in Gum was extremely expensive - the smallest container - some 20g - cost more than 3,000 rubles, i.e. about 100$ - , but they are only for home consumption. Gum was filled up with Western brand shops. Even an ordinary supermarket has an enormous variety of goods (right). Gum has an exquisite food corner. A small caviar package cost here 100 $ (two photos below). 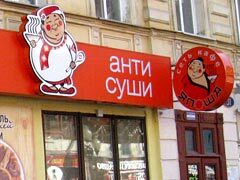 While material abundance is something new in Russia, I could also feel a slight change in Russian-style customer service. I cannot say "improvement". But, there were service staff, who were reasonably friendly and occasionally offered a smile to guests. 20 years have passed since the end of the Soviet Union and many waiters, waitresses and receptionists whom I met in Moscow, do not remember the socialist times. Therefore, it is not surprising that they behave differently from Soviet Russians. But, it was a new and positive experience. In the 1990s I often heard media reports on pensioners and other socially handicapped people, who were suffering from the devaluation of ruble. The recent economic crisis might have brought another difficulty to those people, who do not make profit from the market economy. However, those poor people were taken care of by the government to some extent, I heard, and the number of middle class people seemed to be growing. 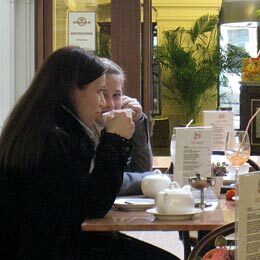 In restaurants - not too luxurious but comfortable - I found many guests of different ages. They seemed to enjoy fully the change in the Russian society. I hope that the liberal course will persist in Russia and that the reactionary policies will not overwhelm the country and bring the whole nation back to the old autocratic Russia. 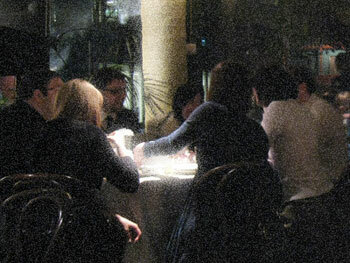 Young people enjoyning an evening in a restaurant. 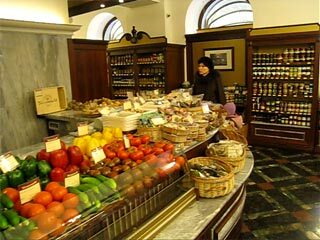 A self-service restaurant in Albato street offers good quality foods at reasonable prices. 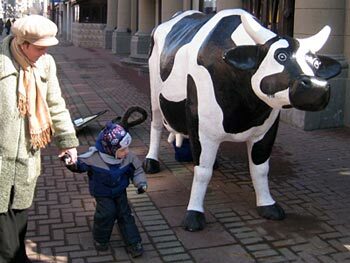 And its symbol cow is popular among children. There is a Japanese ramen noodlerestaurant chain with sumo-wrestler (?) mascot.